Our very first release on Split Notes – from that lovable drum and bass enthusiast Sevish. 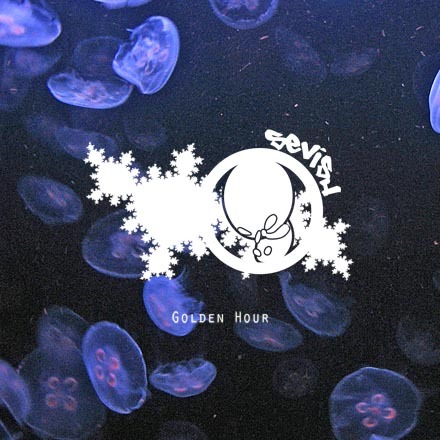 This album titled Golden Hour touches on dubstep, breakbeat, IDM and hip hop, but has a big d’n’b slant as you’d expect from Sevish. Golden Hour is arguably the most exciting work by Sevish yet. “Ok, so people’s first reaction to this sound is often ‘that sounds out of tune’. In reality, it’s ‘in tune differently’. That’s something to embrace because those differences give a new character to the music that just aren’t possible with the 12 tone system. Take the Bohlen-Pierce scale. It sounds absolutely weird for the first few minutes you hear it! It’s exciting, but it’s shocking – and it takes a while to make sense of it. What’s going on is that you are unlearning your ideas about what is ‘in tune’ before you understand that the Bohlen-Pierce scale can be extremely dynamic sounding, either chillingly alien (used in Mako Haze) or serene and restful (Callisto), and a new experience in listening that you’ve never had before. “Then take the 5-tet scale (used in the track Fifteen) which has an oriental character and doesn’t seem to sound out of tune to many people. Actually it’s quite badly out of tune but we think it’s great anyway. Its sound is quite familiar but otherwise the feeling of 5-tet is simply impossible to recreate in the Western 12 tone system. 8 Calabi-Yau Manifold “JI-11” preset I found on a synth! Golden Hour by Sevish is licensed under a Creative Commons Attribution-Non-Commercial-No Derivative Works 2.0 UK: England & Wales License.